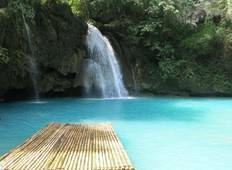 See the top Nature & Adventure trips that go through Philippines. With 44 tours to choose from, they range in length from 3 days to 21. The most popular month for these tours is May, which has the most departures. "Very good trip!! Riza was fabulous and a friend for life. 10/10 would recommend!!" "Absolutely amazing tour!! Guides were amazing, every informative and took great care..."
"Great guides, great destinations and brilliant group :)"
"Wow where to start! This trip has been life changing no word of a lie! Not only was..."
"Great trip and very good tour guide! The hilight was Port Barton, with an entire..."
"Has the best time with these guys. Jon and Thor will ensure you have an incredible..."
"The itinerary was varied and interesting. 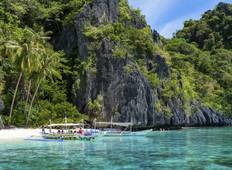 The trekking was quite challenging but..."
"El Nido was the absolute highlight of this trip. It felt so incredibly remote, like..."
"The destinations were chosen perfectly & the guides were amazing! They were always..."
"We really enjoyed our tour, Julius is very thoughtful, the camp is fantastic, and..."
"I was the first to arrive from the group so had some one on one time with Shella..."
"It was perfect, the food was really good"
"Amazing trip! Better than expected in every way, apart from one accomodation - ASEAN..."